Parcon Resilience is a people of color centered practice. May all of us (POC and white) build our capacity to undo racism in our lifetime! People of color affinity spaces are important for finding respite and healing from white supremacy and getting the support we need to continue on. Parcon Resilience will advocate for POC only spaces in all environments. We use Parcon to support our collective wisdom to practice self-love, empathetic community and the movement of our history and shared visions. For myself and many other POC, we have been turned off from the common ways that Contact Improvisation have been practiced because it minimizes our trauma by asserting a color-blind attitude that denies non-white ways of embodiment, or we have been transgressed. This is a space to find CI on our own terms. For white people, we use Parcon to support white reflection in building capacity to acknowledge and be present to reality, to make space and stay engaged, to open up resource and accessibility, and to be agents of accountability. I seek to create space for safe POC self determination within traditionally white CI spaces. I will support white people to do their own work. And I will share in integrated spaces where proper preparatory work is done to move forward together. We have developed POC only CI Jam spaces with the facilitators for this Jam and supported the development of a regular POC affinity space throughout the year. 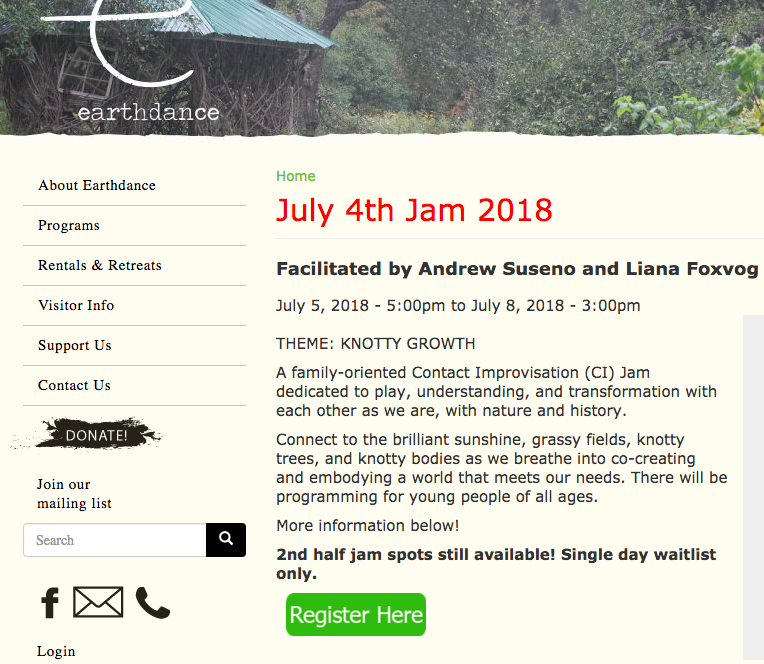 I had the honor of co-facilitating the July 4th Jam at Earthdance for 100+ people using the Parcon framework to create safe spaces for POC and white people to work in affinity groups and together through hard discussions and movement on race in the community. I am excited to come to the Oberlin Campus to teach a Parcon Intensive Weekend. The white student leaders in the CI community at Oberlin have allocated some of the teaching time to POC only workshops spaces and are supporting me to connect with POC leaders.